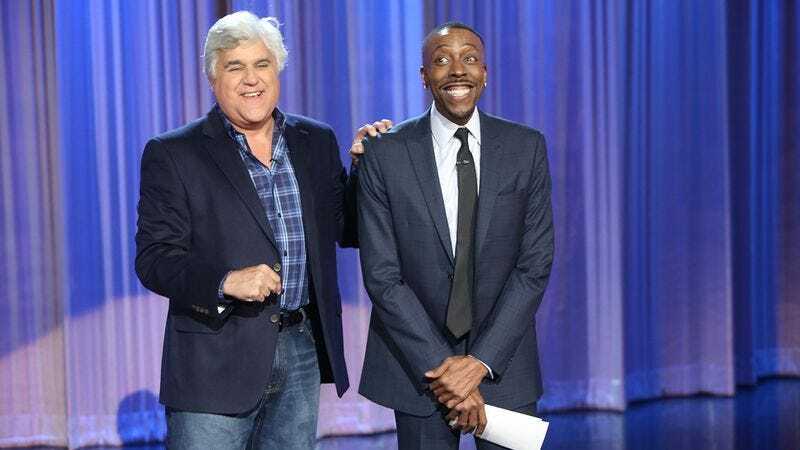 Arsenio Hall’s improbable late-night comeback will continue for at least another season, as Hall learned from Jay Leno last night on his show. Producer CBS Television formally announced the renewal today, but viewers of the show heard the news last night when Leno came out during Hall’s monologue. CBS and partner Tribune Television apparently agree, with CBS Television Distribution president Joe DiSalvo boasting that Arsenio is “the youngest late-night talk show on broadcast television.” How young? The median age for an Arsenio viewer is 50.1, which goes to show late-night remains the domain of the olds. Variety calls Arsenio’s renewal “expected, though it wasn’t a slam dunk,” and as recently as a three weeks ago it was on the bubble. But with The Tonight Show now back East, Arsenio could score some better guests, Variety speculates. That’s good, because the show’s bookings haven’t made it appointment viewing. This week’s lineup of LL Cool J, Scott Bakula, Deion Sanders, Cloris Leachman, and Jada Pinkett Smith is typical.